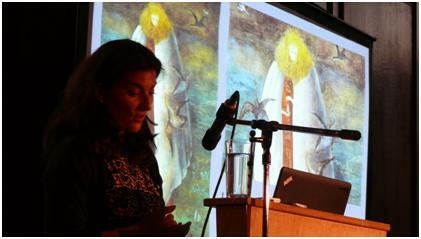 This week Sophie Byrne, IMMA’s Assistant Curator for Talks recaps our highly successful Seminar Rediscovering Leonora Carrington held last Tuesday 17 September preceding The Celtic Surrealist exhibition opening. One of the highlights in the Carrington Talks series so far has been the recent Seminar Rediscovering Leonora Carrington. 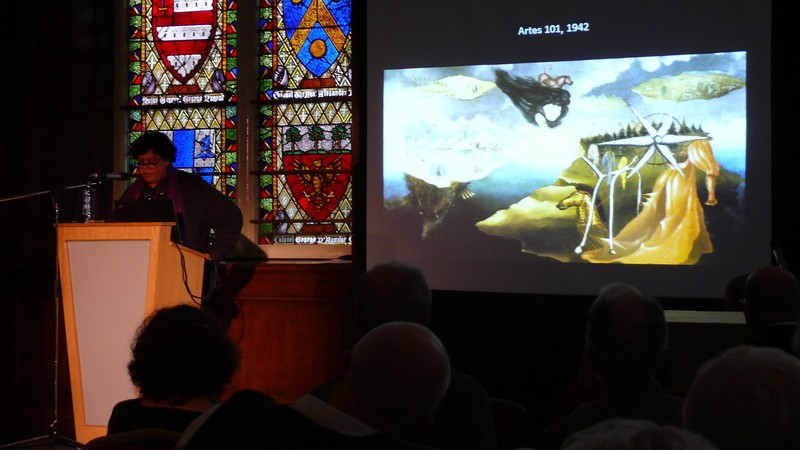 Leonora Carrington was the sort of artist everyone had a story about, and no more so than the impressive group of scholars who gathered in IMMA’s Baroque Chapel on Tuesday 17 September to present their lifelong interest in, and research on, Carrington’s work. Roisin Kennedy (Chairperson) , Seán Kissane (Exhibition Curator), Dawn Ades , Alyce Mahon, Guilia Ingarao, Teresa Arcq and Susan Aberth all gave in-depth interpretations of the rich iconography involved in Carrington’s paintings. 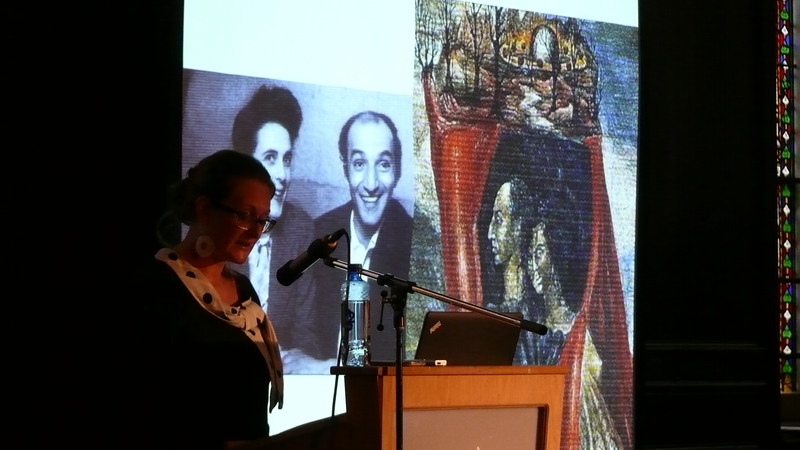 The speakers shared their extensive research including her involvement with Max Ernst and Edward James and the Surrealist movement as well as her friendships with other female artists. 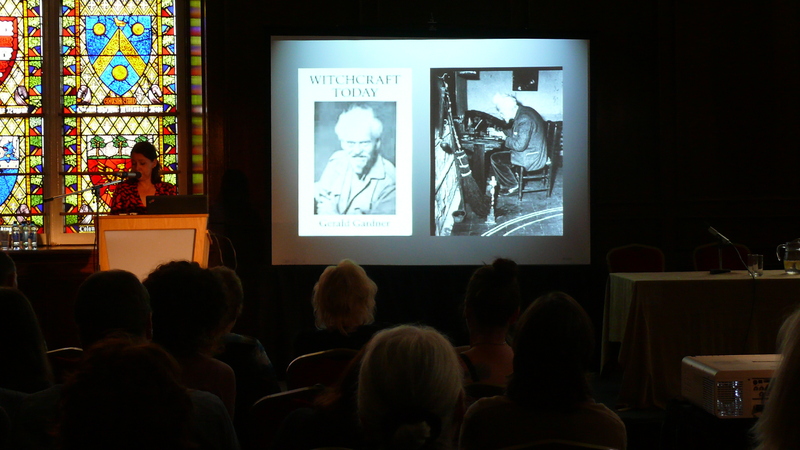 The day’s presentations opened up contexts on the artist’s interests in Irish literature, Celtic mythology, alchemy, magic, the occult and the animal world, all of which illustrated the significance of the artist’s past, her Irish and Mexican connections and her awareness of colonial issues. 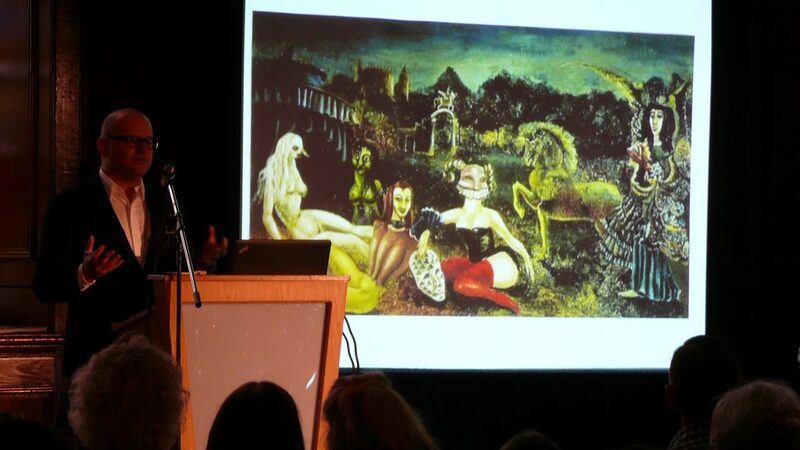 One of the best parts of the Seminar was seeing Leonora Carrington through the eyes of the speakers. To them, she was the creator of imaginative stories, paintings, tapestries, drawings, sculptures and murals. Overall, the views expressed in the Seminar were both dynamic and informative. It seemed the inherent challenges for the curator or art historian studying Carrington was deciphering “the imaginative” from the “autobiographical” in her work. But exhibition curator Seán Kissane, who has spent the past four years bringing The Celtic Surrealist to life at IMMA, asserted that Carrington’s figurative dreamscapes were better placed in “the politics of the real world” and not her imagination. So much was said that a blog can barely scratch the surface of the Seminar, but here’s a quick recap of the day’s talks. Dawn described Carrington’s friendship with her biggest supporter the Surrealist collector Edward James. “Both shared and fled a similar background: a social world of arcane rituals, subtle hierarchies, sacrifices and feasting traditions of country England.” She quoted Edward James, “Carrington’s paintings are not painted they are brewed.” And Dawn asserted that James was the first to claim Carrington’s Celtic inheritance. Alyce discussed how Carrington initiated her on-going studying of eroticism, art and Surrealism. She focused on Carrington’s work as a writer of “quasi autobiographical stories” that led Mahon to Mexico and New York as a young scholar to investigate Carrington’s “prototype feminist work” as a part of the female Surrealist tradition. Mahon expressed the poetics of coming to see this retrospective at IMMA. 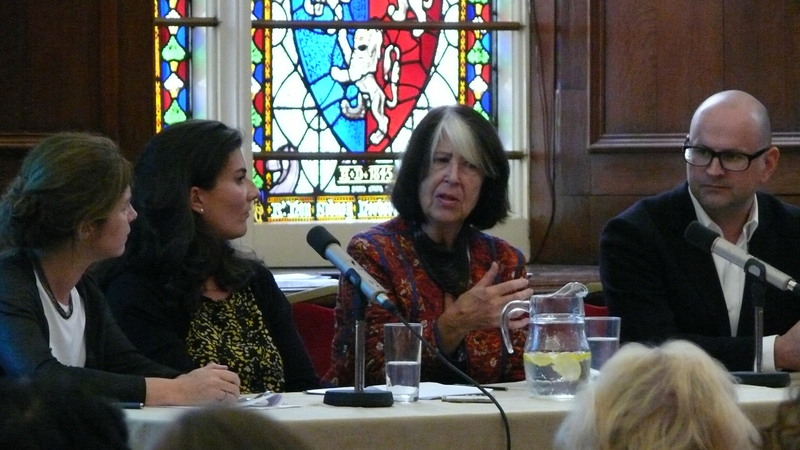 Roisin Kennedy, Alyce Mahon, Dawn Ades and Seán Kissane shared their views on how it was Art Historians failed to recognise the true merits of Carrington’s work and not the other surrealists. Giulia discussed details of the house Carrington decorated with Ernst in Saint-Martin-d’Ardèche in a 1938 show. She said, “The artist’s first experiments in sculpture [connects to] the tapestries she created in Mexico in the 1950s with her husband Emerico Weisz and with the help of a family of native artisans.” Both the tapestries and house revealed Carrington’s rich anthropomorphic interests in the hybrid animal worlds, a theme she continued to research during her most productive years in Mexico. Roisin Kennedy, Giulia Ingarao, Teresa Arcq and Susan Aberth all reflected on Carrington’s work and why female Surrealists were attracted to Mexico in the forties and fifties instead of New York. 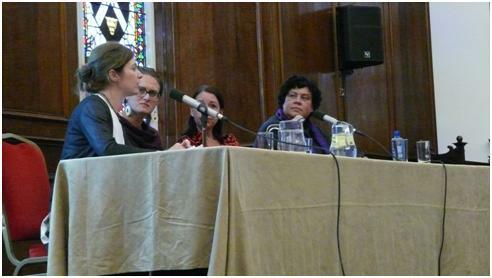 Teresa explained the ethnic and political structures of Mexican Society during that time, and the panel commented on Carrington’s broader commitment to spiritualism and her relationship to audience. Aberth said, “Carrington never thought of the audience at all in making her work. She believed whoever was meant to see it, would see it. 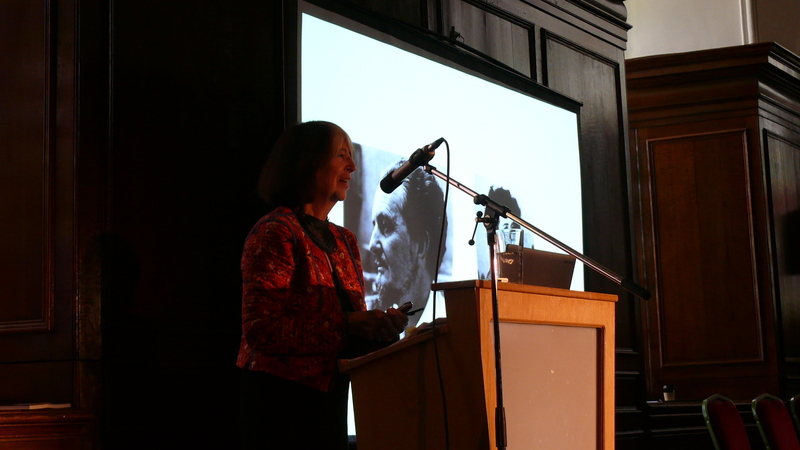 Having seen how Carrington’s work re-ignited the general appeal of Surrealism, it was no surprise that the seminar attracted large audience of lecturers, art historians, curators and a cross generation of artists including Alice Maher and Janet Mullarney. 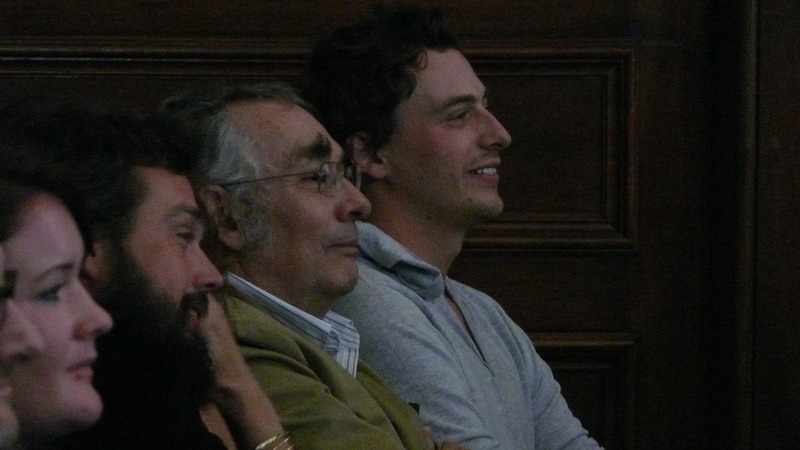 It was also a pleasure to see Leonora’s son and grandson enjoying the seminar. I thought that for all who attended, the Seminar revealed the complexities that underlay the work of this unique artist, writer, mother and endearing friend to those who so fondly spoke of her. Having heard the wonderful insights into what motivated Leonora from the most esteemed Carrington scholars, I believe that a real scholarly consensus on the value of Carrington’s oeuvre has been achieved. Coming Up…Pioneering scholar, the brilliant writer, Whitney Chadwick will share her personal recollections of Carrington in a conversation with Seán Kissane on Thursday 3 October at 6.00pm at IMMA. Tickets are free and can be booked here. Looking forward to sharing more Seminar podcasts with you, shortly! Sophie Byrne, Assistant Curator Talks Programme, IMMA.